We set out early from our hotel the day after the pelagic tour, hoping to reach Big Sur by noon. This well-known Condor hotspot would serve as the turn around point for our almost month long vacation. 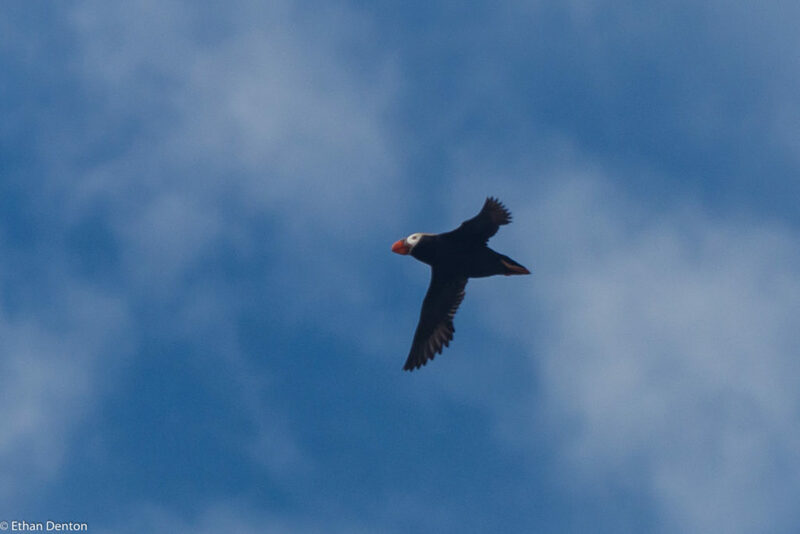 Fools that we were, we thought it would be a simple task – reach the area, find a walking trail with some life birds reported on it recently, and watch the skies. In fact, we never even made it to Big Sur. The plan was derailed before we even hit the freeway, as a silhouette atop a lamppost piqued our curiosity. Trailing the bird as it dropped from the pole and alighted in the parking lot of the hotel, the white wing flashes of a Northern Mockingbird became apparent. Lifer! Hopping out of the car to fire off a few shots of the bird, I noticed a yellow form swoop up into a nearby palm tree. 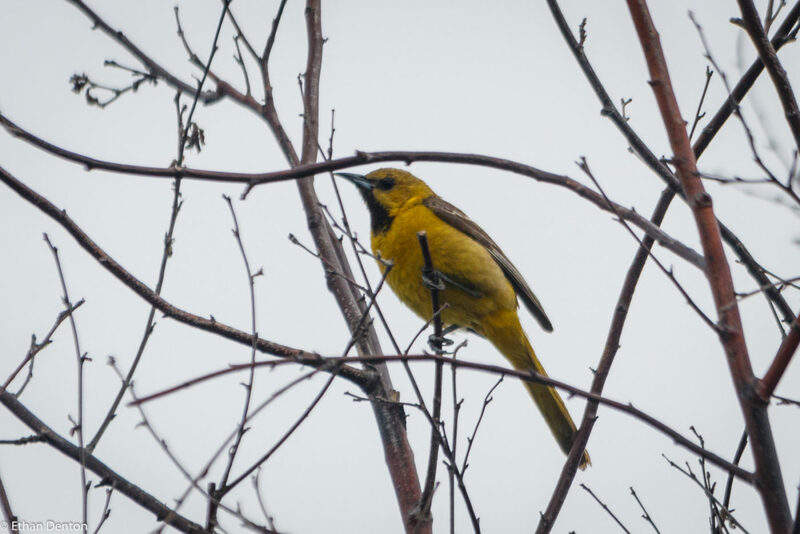 It soon shifted to a leafless alder, and we confirmed it as our second lifer of the day – Hooded Oriole! With two life birds to our name before we had even departed for the day, things were looking good. Our next stop was a speciality stop. For many years, a solitary Northern Gannet has been stuck on the west coast – theories run that it came over the continent, through the arctic sea, and no longer knows how to return whence it came. Word was that the bird was currently located at a spot known as the Devil’s Slide Trail, on Egg Rock. After a short, easy walk into the area, we happened across a man who informed us that the Gannet was currently perched atop a rocky island with thousands of Common Murres. Yep, it’s there! 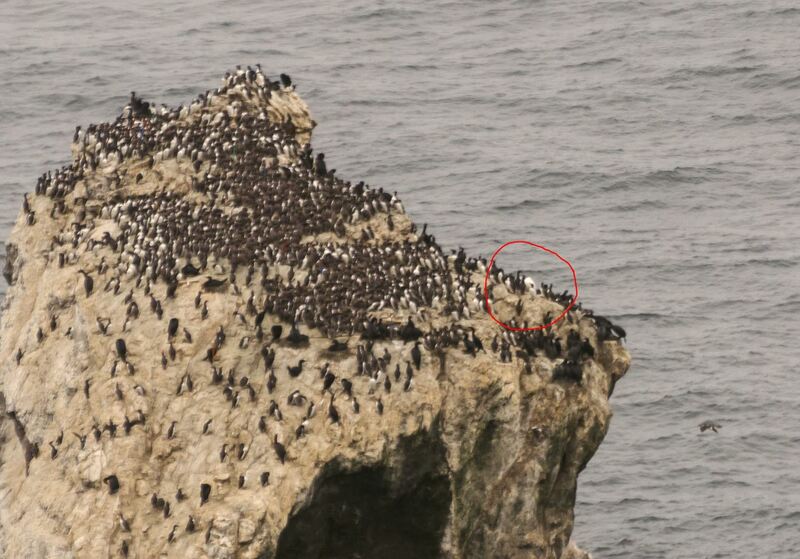 Can you see it among the murres (Gannet circled in red)? Fortunately, I had my scope and we were thus afforded some excellent views of this extreme rarity. By now, we were running hours behind schedule, so we stopped for lunch in a small Santa Clara town. Birding the ponds nearby, we found Purple Finch, Bushtit and two species of Towhee. 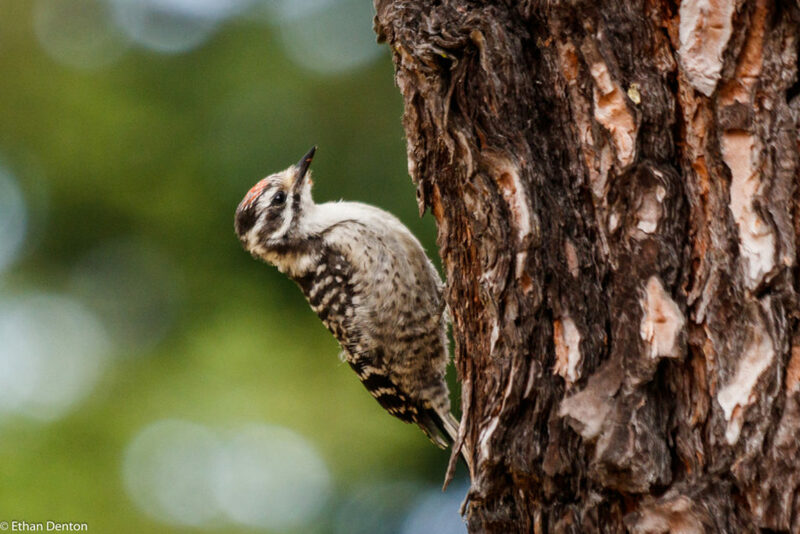 The highlight slipped into a small tree unobserved, but when we found it, it was observed with gusto! A lone Lesser Goldfinch made our fourth lifer of the day. California Condors being our main target that day, we rushed down to maybe twenty miles north of Big Sur, before slowing down and gluing our eyes to the sky. 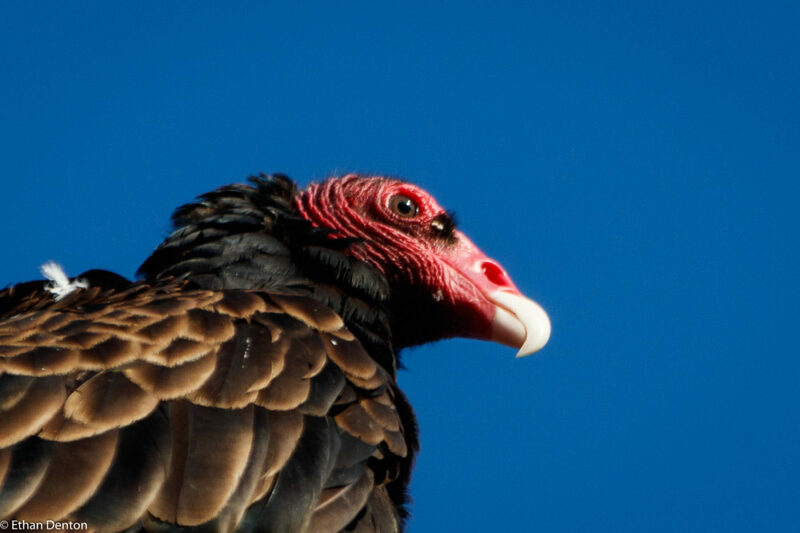 As every Turkey Vulture came into sight, it was rapidly assessed before being dismissed as too small. 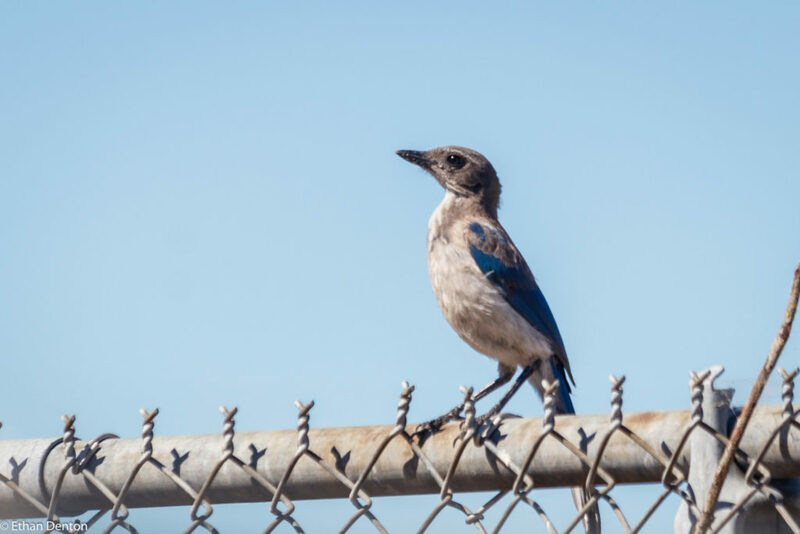 Eventually, one bird seemed larger, soaring close to the ground to the right of the road. Pulling over to check, we confirmed the sad news yet again; not a Condor. Yet even as I swung my legs into the car, I saw something appear over the hill on the opposite side of the road. Surely this could not be a bird, it was too large. It had to be! 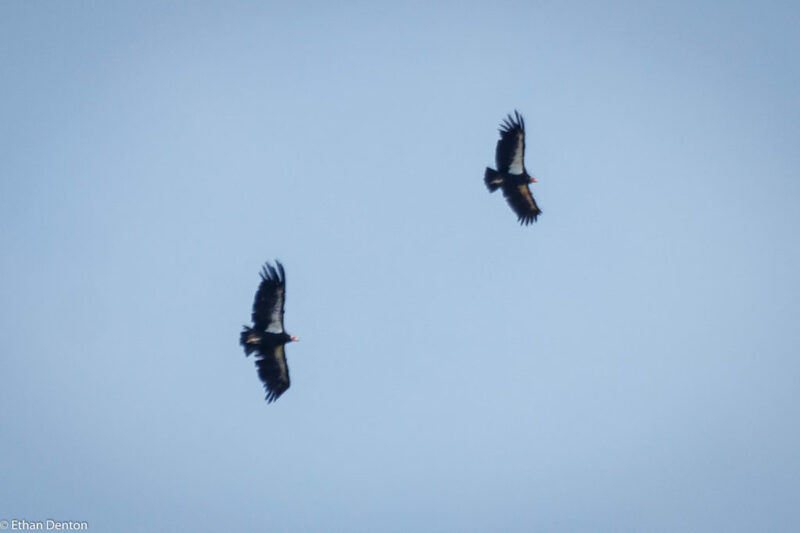 But there was no doubt about it, as we watched a fully fledged California Condor materialise from the heavens, swiftly followed up by three more – a family group! The majestic raptors soared high overhead, barely moving a wing as they floated over the car towards the sea. Mission accomplished! From there, we swung the car around and began the long trek north, resting that night roughly thirty miles south of our starting point that morning. 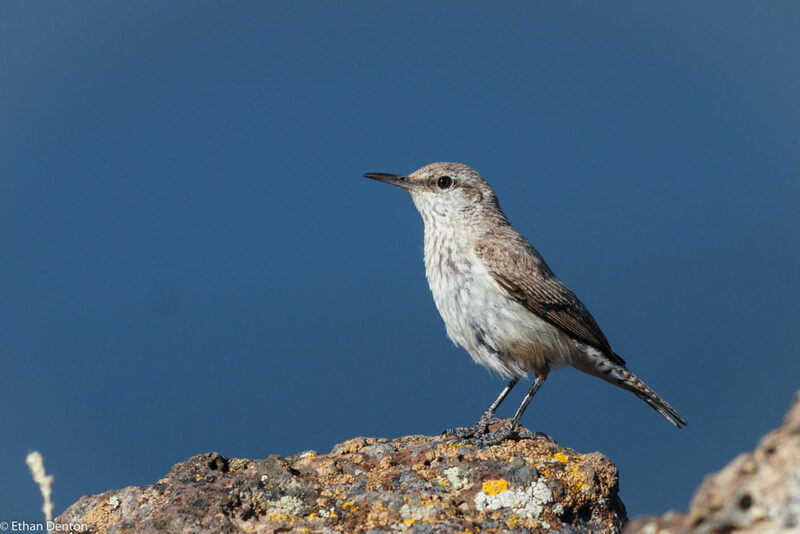 Our first stop of the second day was at a hotspot known as “Arroyo Del Valle” – a place suggested by a friendly young couple on the pelagic for potential Yellow-billed Magpies. 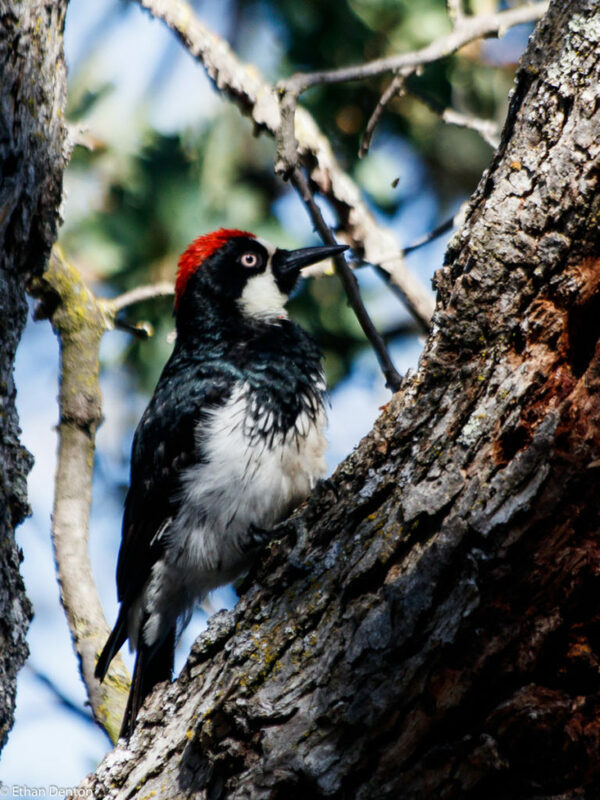 Though we found none of the endemic counterparts to our own magpies, we enjoyed an overwhelmingly successful time there, with Oak Titmouse, Acorn Woodpecker and Broad-tailed Hummingbird welcoming us to a lush habitat where we found four life birds in under two hours. Exploring the area, we added California Thrasher and more Lesser Goldfinches to the list, before finding a pair of Ash-throated Flycatchers right at the end. Turkey Vultures were also very much in evidence, with over 20 observed. Only three major stops that day – Arroyo Del Valle, Hayward Regional Shoreline and the Yolo Bypass. We visited the shoreline second, searching for Least Terns and Snowy Plovers. 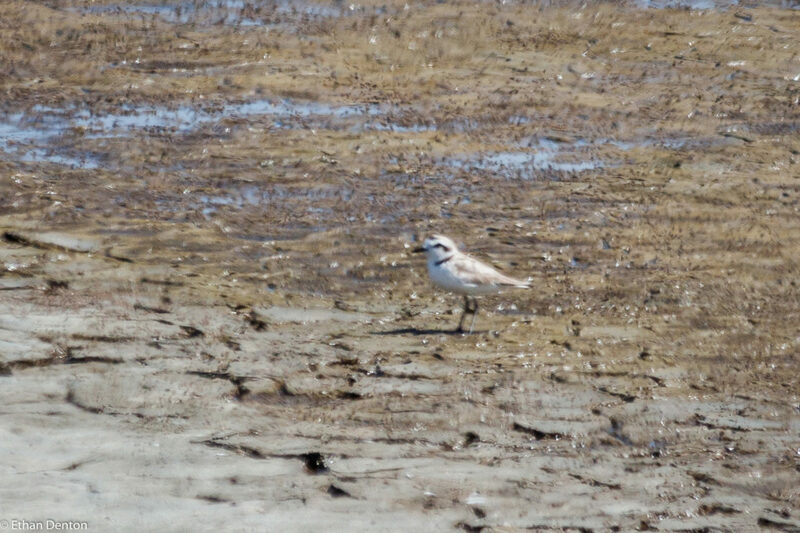 Having missed out on the plovers at Leadbitter Point, we were eager to find this threatened species before we drove ourselves out of range once more. Before long, we had located a plover – more than one, in fact. 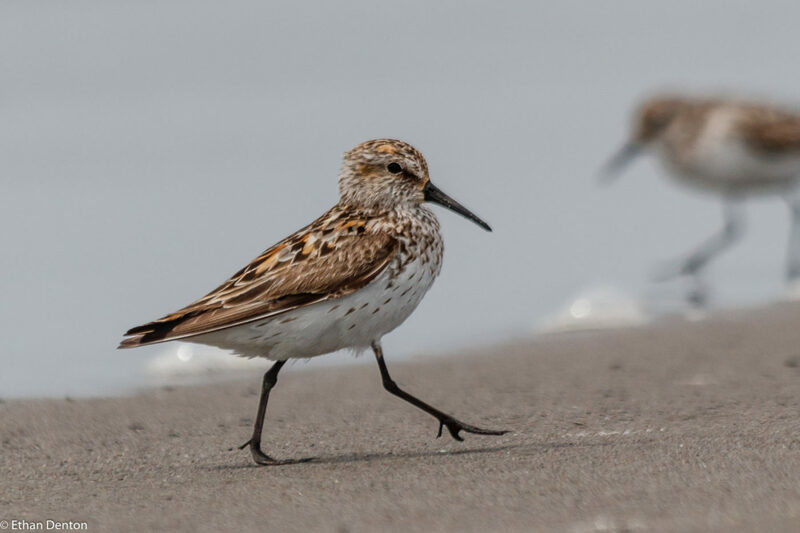 Six adults shepherded three young ones, being careful to never approach the path; they stayed so distant that it was difficult to get a shot of these diminutive shorebirds. 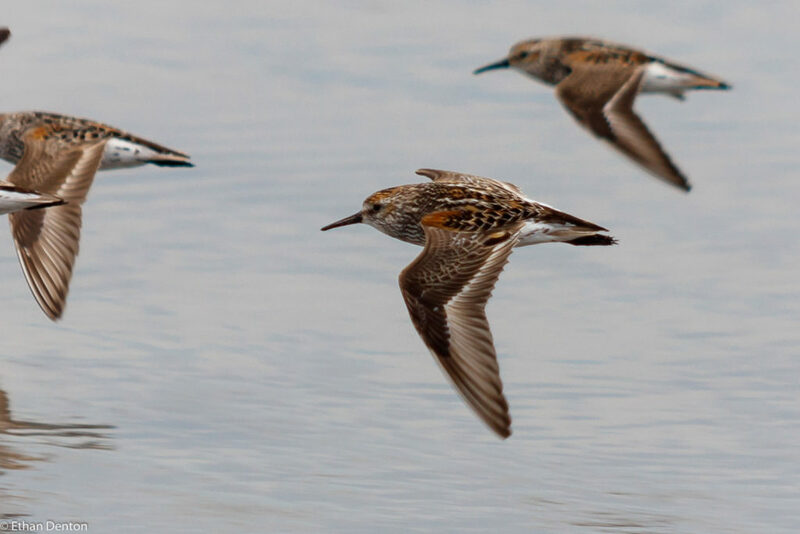 Yolo Bypass (our final spot of the day) was steaming hot, and while we only found one life bird in the form of the Great-tailed Grackle, we came away with many species of sandpiper and waders. 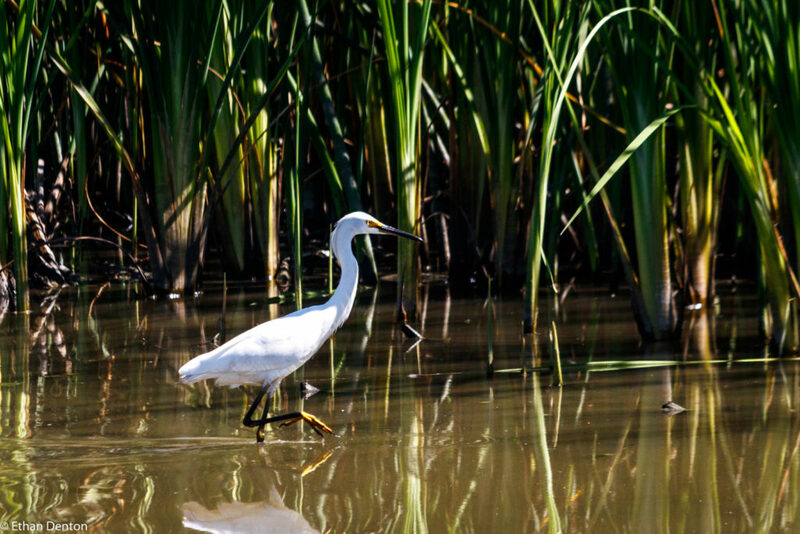 Snowy and Great Egrets mixed with Dowitchers, Western and Least Sandpipers to form a patch buzzing with life in the sweltering heat. Late that night, we snagged the long-awaited Yellow-billed Magpie. The last two days were about driving more than birding, though we still saw some exciting species. Breaking through the Oregon border, we picked up our only Black-throated Grey Warbler of the trip along with two Nashville Warblers before reaching Eagle Ridge in Klamath. Though we spent little time here, we managed to pick up five Williamson’s Sapsuckers, an Olive-sided Flycatcher and even a Sooty Grouse. 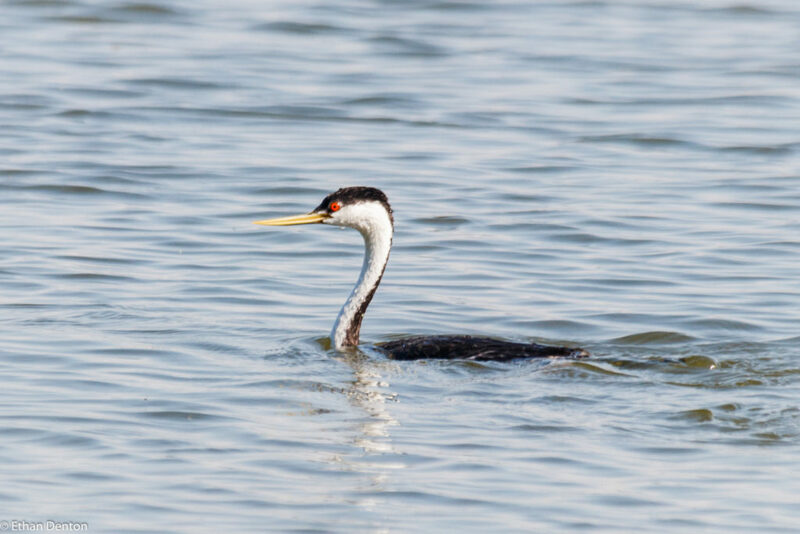 Farther north, we found a lake brimming with Western and Clark’s Grebes. At last, the penultimate day of the trip arrived. We had but one regret, one which we intended to fix before leaving for good. 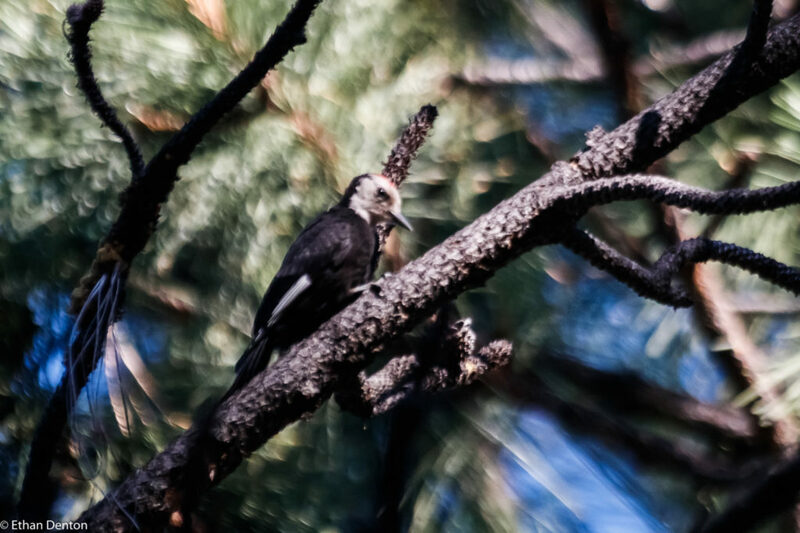 Time after time, we had missed out on one of my top priority target birds, the White-headed Woodpecker. With only one more chance to get it, things were looking grim. Our last hope lay in the mountain town of Sisters. Here, we hoped to find the AWOL woodpecker, with maybe even a Pinyon Jay thrown in. After over an hour, we had heard Pinyon Jays, but found no woodpeckers. 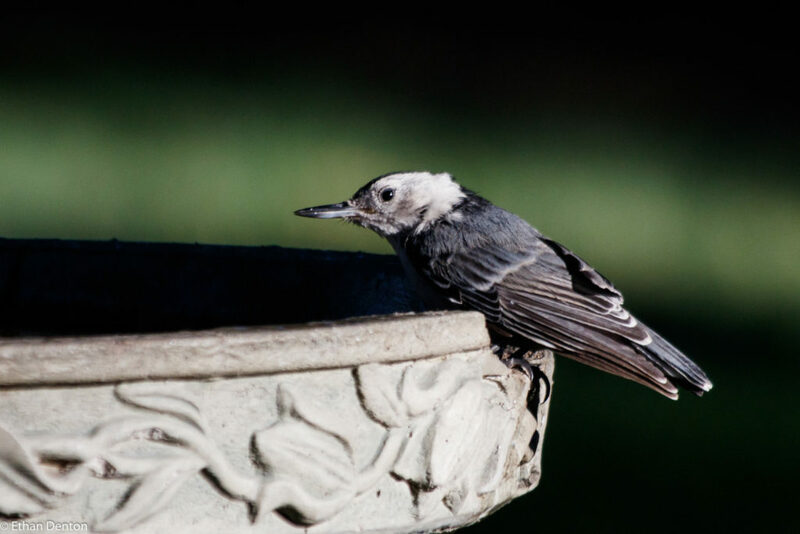 Giving up, we returned to the car, when I spotted a flash of white at a birdbath. At last, the White-headed Woodpecker had decided to make an appearance. Like the Snowy Plovers, the White-heads proved incredibly difficult to photograph, rarely venturing out into the open, and mostly staying in the dark, out of sight. On that note, we left Oregon and blazed through Washington back to BC, and from there home to Alberta. We left the trip with an amazing 37 lifers, and 188 total species across 75+ checklists and almost 5000 photos. This entry was posted in Alcids, Birding Trips, Birds, Camping, Lifers, Other, Passerines on August 21, 2018 by BirdBoy. 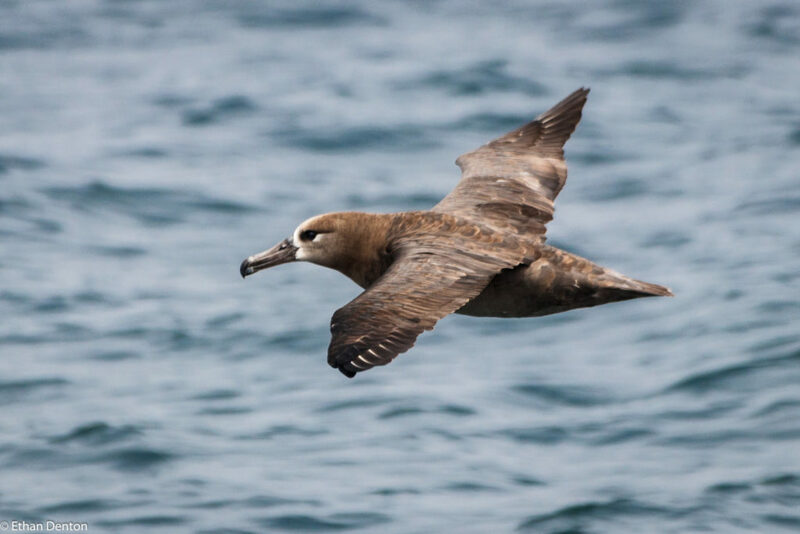 The Albatross has long been considered an ill omen among sailors. 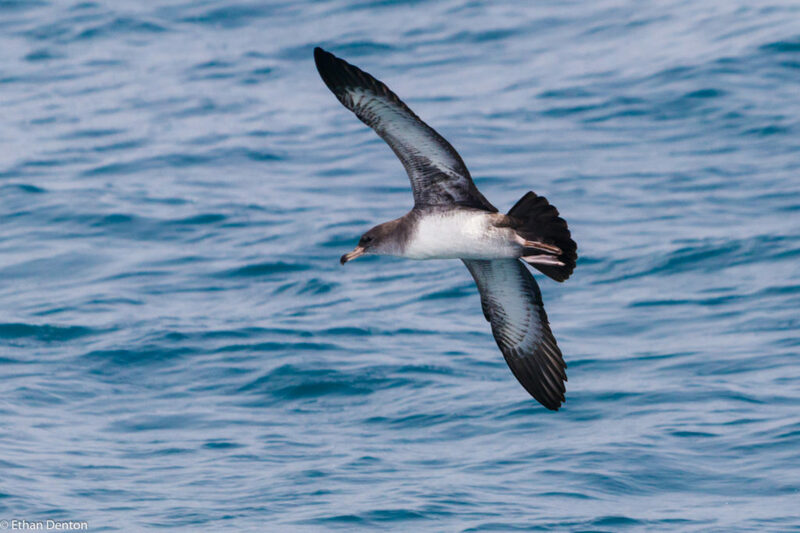 Ironically, it is in the pursuit of these very same creatures that I come up against my own metaphorical “Albatross.” Despite multiple attempts, a pelagic trip (an oceanic birding tour) has eluded me throughout the years. 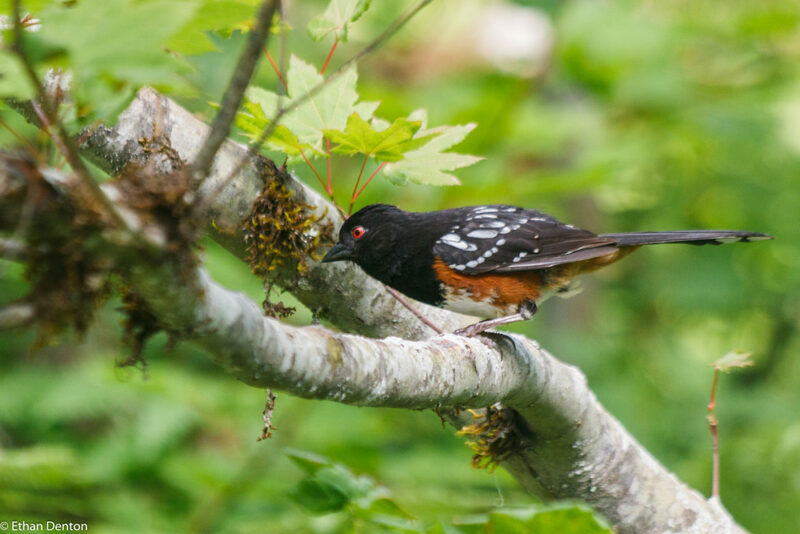 Blocked by fog in Tofino, closure in Victoria, and lack of transportation on the east coast, I have somehow managed to reach my ninth year of birding without experiencing one of these trips. This, however, would all change on July 14, when we would sail out of Half-Moon Bay, California. Up at five-thirty to drive out to the pier, where we met Alvaro Jarmarillo and the rest of the group at 6:30 AM. Filing aboard the New Captain Pete, we were met by the pleasant news that the boat was stocked with fresh coffee, biscuits and some excellent fresh strawberries. 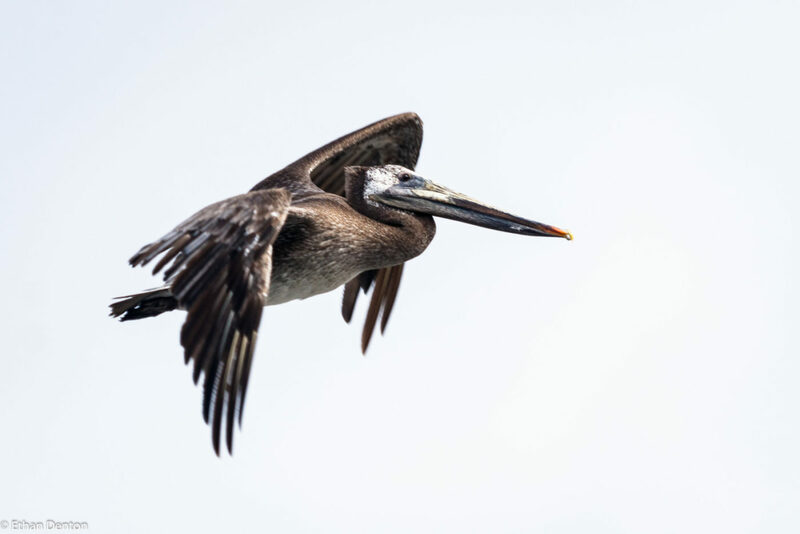 Departing the harbour in a cloud of fog, we identified the usual mix of Brown Pelicans, Heerman’s and Western Gulls. 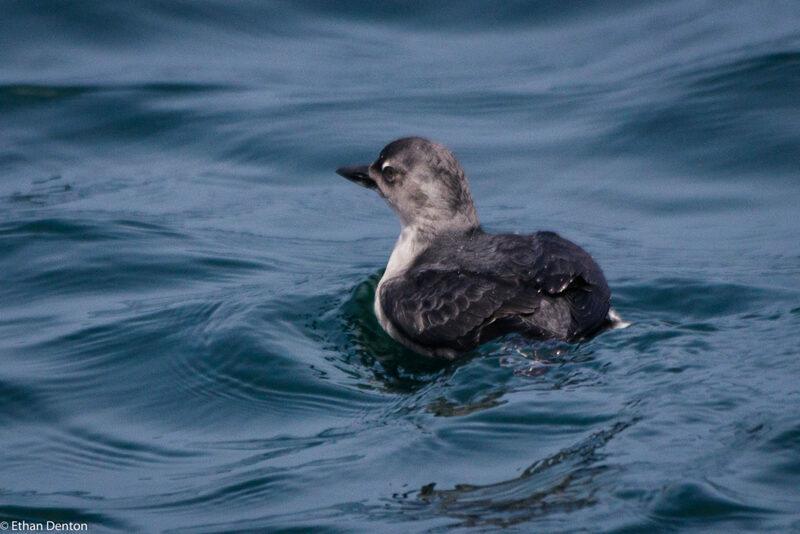 Two Marbled Murrelets – only the second time we had seen these unusual birds – floated half a mile offshore. 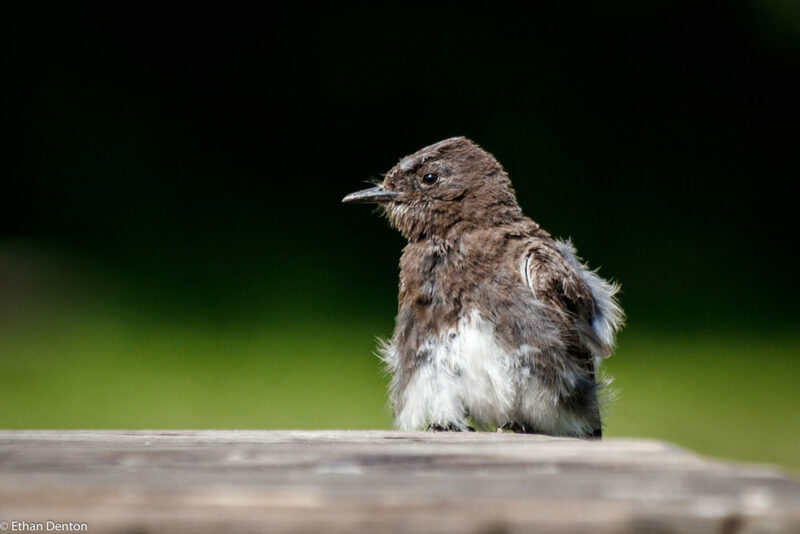 Murrelets oddly nest in deep forest groves, miles from the ocean, where they return to spend the majority of their lives. 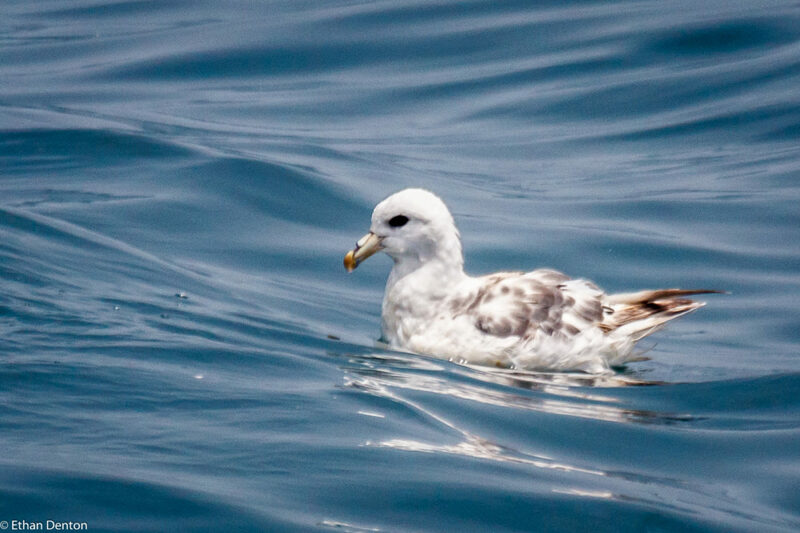 The first life bird of the day came surprisingly early, and would be a common sight over the course of the trip – Northern Fulmar! These funny little tubenoses were never boring, coming close to the boat for photos in their array of colours, from mottled grey to chocolate brown to a pure, glistening white. 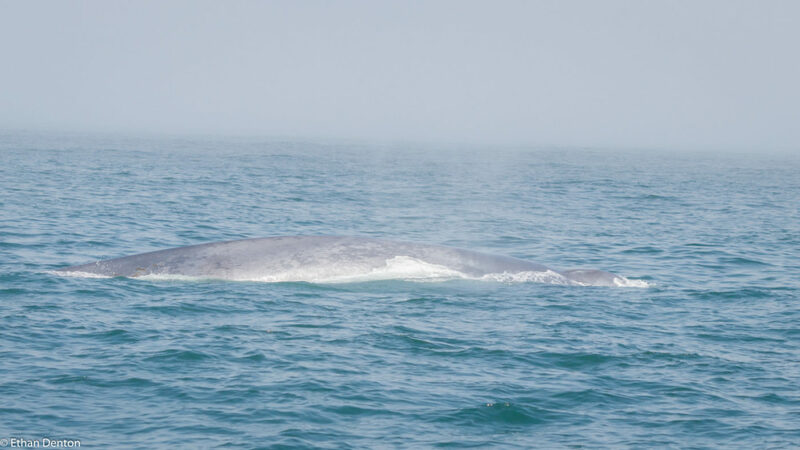 As we neared our primary destination, a pod of whales surrounded the boat – Hump-backs, Fin Whales and a small unidentified whale swam further out, but close to ten Great Blue Whales breached nearest our vessel, granting many close views of their broad backs and explosion of mist that was their breath. Having the two largest mammals in the world (Fin Whale being the other) surrounding us was an amazing experience, if a little nerve-wracking. Approaching the islands, we were treated to our first ever views of Cassin’s Auklet. Impossible to photograph, the tiny alcids would bounce from wave to wave in increasing speed as the boat came near, before finally gaining the momentum to lift off. Eventually, however, one accepted our presence long enough for us to catch a few shots before vanishing beneath the waves. 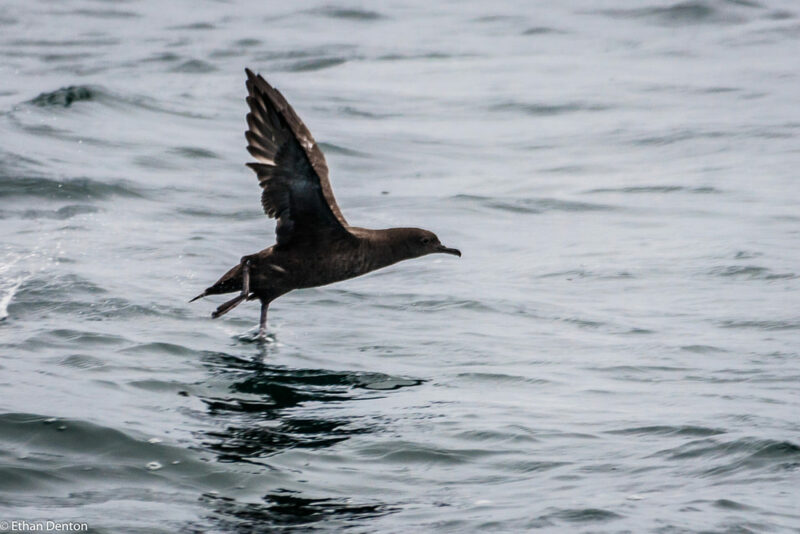 Sooty Shearwaters skimmed the sea, and, though relatively common, rarely approached the ship. 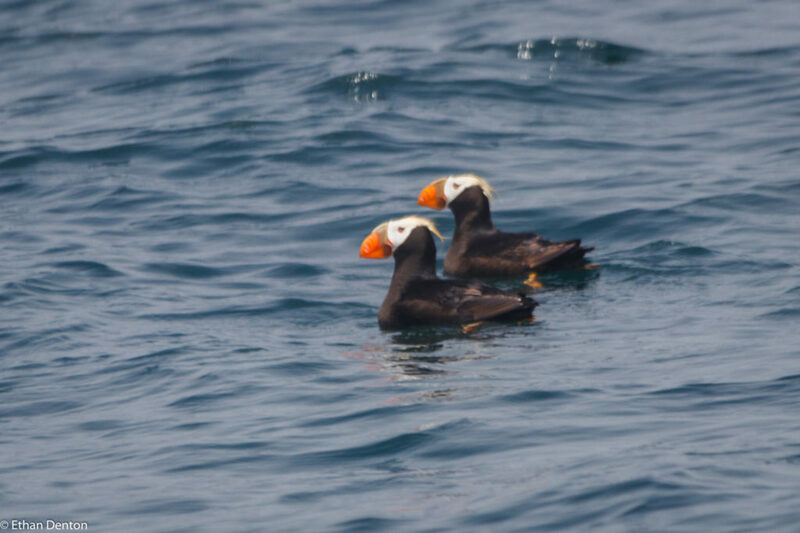 Our day was spotted with Puffin observations, each of which was punctuated by a scream of “Puffin!” which resounded from end to end of the boat, alerting all the passengers of the nearby alcid. Once, we were lucky enough to have one fly only a few feet above the boat, and another time a pair rested contentedly as we floated within 100 metres of them. All in all, we were very fortunate with the Puffins. My highlight came as we coasted along the continental shelf, in a heavy patch of fog. I gazed into the distance, not expecting much, when a massive shape loomed out of the fog. It drifted towards us on silent wings, bigger than any bird I had seen before, and there was no doubting what it was. An Albatross. The bird passed, shrouded in mist, but we would see another. Nine more, in fact. Black-footed Albatrosses were the undeniable high point of the day, and while we saw no Laysans, I was more than content with the obliging birds. And I’d include another photo of the goliaths had it not been for another lifer, the Pink-footed Shearwater. A duo of the avians paused next to a young Albatross, presumably for a patch of food, though we observed none. As we neared their location, a Shearwater flew up, and banked past us offering excellent views of its white underwings and wide wingspan. Returning to shore, we saw few birds other than the murres, which had shown up in their tens of thousands that day. 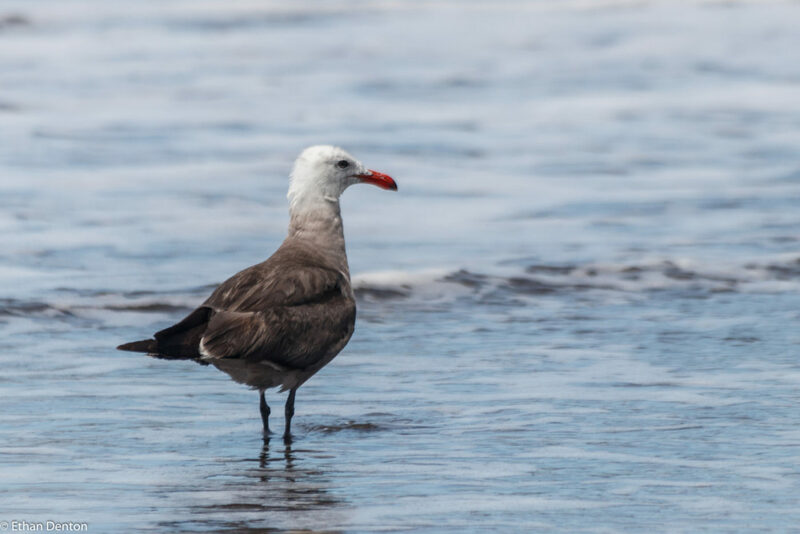 Eventually, a pair of dark birds were spotted on the horizon, which we could only assume were gulls signifying the proximity of land. Fortunately, we were wrong. Two immature Long-tailed Jaegers zoomed away over the sea, leaving us with an adult Sabine’s Gull as the only gull we saw at any distance from shore. On reentry unto the harbour, we identified Surfbirds and Black Turnstones, in addition to an extremely distant pair of Elegant Terns as our fourteenth, and last lifers of the pelagic trip. Thanks for reading, and stay tuned for the final post of the trip! 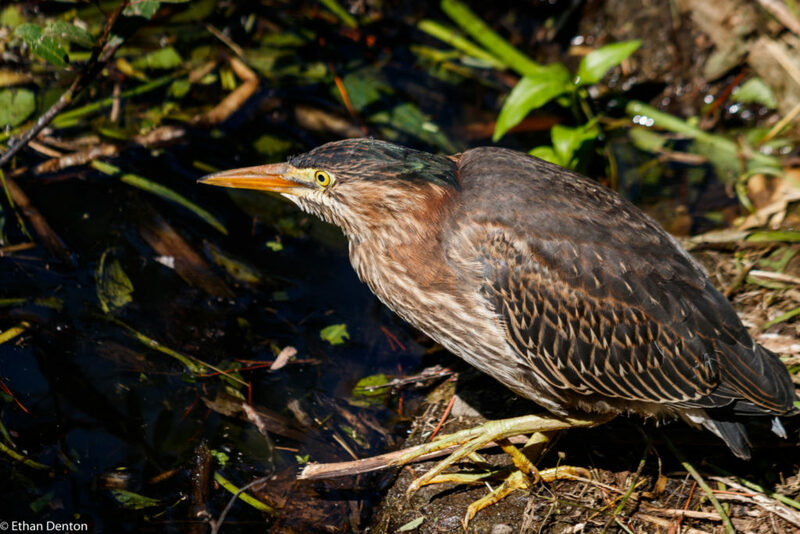 This entry was posted in Alcids, Birding Trips, Birds, Lifers, Mammals, Pelagic Trips on August 4, 2018 by BirdBoy.